Greetings from Metalheads forever, we are glad to have you with us for our upcoming Issue, How are you doing? Hi! It’s our pleasure, thanks for having us there! We are doing great, thanks. Hope you too. “Dirge for the Archons” has just been released on the 18th, how do you feel about the outcome? We are very happy with all the reviews so far. All of them are being great and we feel so honored to have been even considered as one of the best symphonic metal releases of this year! We have also had the chance to play some of the new songs live in a mini tour through Spain, Belgium and the Netherlands and people really liked the songs live too. Can you tell us about the metal scene from Spain as we have not seen much metal bands from Spain? There are plenty of them, but the most popular metal here is the one sung in Spanish, generally old school heavy metal. For this reason they are only well-known in Spain and some of them in South America too. There are also a lot of small bands that are playing more modern styles, but they are not well known and most of them haven’t had the chance to play outside Spain. You are quite known around the world, but do you get the same credit for the kind of music you make in your home City? Last year we had the chance to play a big show in our city with a symphonic orchestra and big choir. We don’t play a lot here actually, so we were a bit afraid, but we can now say it was a huge success. The opera house was full (around 1000 people), so now I think we are getting some credit indeed! Your first album “Secrets” was released in 2010 and by 2016 you have made 4 full length albums, how much time do you spend in the making of music and how satisfied are you in the making? Music is like a drug (but a good one!). When you are musician your brain cannot stop working, I guess is the same with all the artistic disciplines. We just need to create. I guess only musicians know all the time you spend and all you have to sacrifice in order to create music, but we do it with pleasure. When we recorded our first album, we just wanted to do something good and work hard to achieve a high quality result. We had our music in our minds, but mixing all those elements (orchestra, choir and metal) was not easy sound-wise. That was our main obsession back then. We could have never imagined that our first album would be distributed worldwide. We actually had never thought what would come later, but once we got signed we couldn’t stop making more music. We are very passionate about it and very restless: we always want to improve and learn more and more and that’s actually what we have been doing with all the releases. We do everything by ourselves (except the mixing and mastering), we work as composers, sound engineers, producers, arrangers… So we are very proud of all we have learnt and achieved through all these years. The good thing is that we never get bored and we have always something new in mind that allows us to write more stuff and experiment with new sounds. We are seeing a lot of Symphonic metal bands emerging from Europe, Is this the current trend of Metal in Europe? 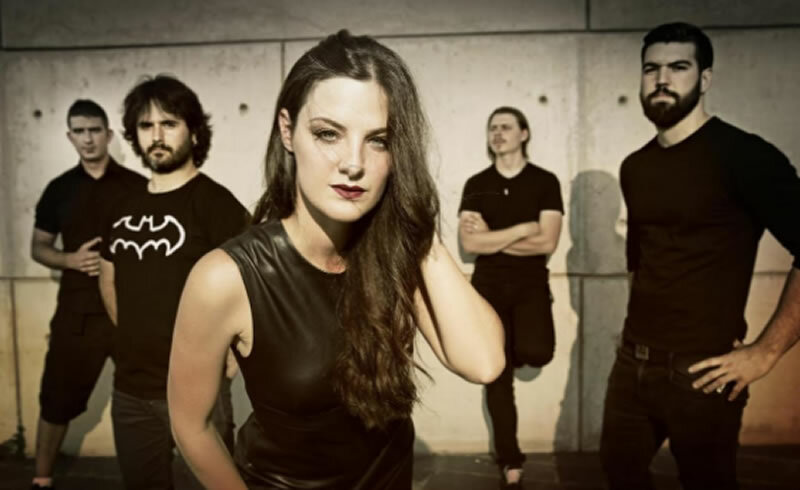 It’s true that Europe is the cradle of Symphonic metal and most of the symphonic metal bands and festivals are European, but nowadays a lot of new genres are taking place everywhere. I don’t think symphonic metal is more popular that other styles. What it’s true is that there are a few very successful European bands touring nonstop and worldwide and that’s a good sign for us that the genre still enjoy good health. What was the reason for Switching over from Metal blade Records to Napalm Records, Was there a huge benefit out of it for the band? Of course it was! We are lucky to be in one of the biggest metal labels nowadays. Now we feel that we are “at home”. Metal Blade wasn’t specialized in our genre, actually we were the only symphonic metal band in their roster and that didn’t help because the promotional circuit was a different one, we were kinda lost there. Napalm has signed the best symphonic metal acts, so is a big honor for us to be in this growing family. We have already released three albums under Napalm and I think we are getting more exposure little by little thanks to being under their label. Hope we can keep on working together and growing with them in the future too! Is there any story behind “Dirge for the Archons” Is it based on any mythology? The Archons were the governors of a province in the classical Mediterranean world, but there is also a second meaning to the archons. According to some cosmologic theories, they are an alien force that intrudes subliminally upon the human mind and deviates our intelligence away from its proper and sane applications. In short, Archons here are representing control and mind manipulation over humans. With this title we claim for freedom and consciousness. The control systems (governments, multinationals…) are constantly playing with us and it seems we are not aware about it. Also, most of the songs in this album are talking about perception. We humans are limited by only five senses to perceive all we have around (a perception that can also be manipulated by other factors, here the Archons), but these five senses are just physical… And what about our spiritual condition? We are losing this capacity and I think that’s very dangerous and one of the reasons why the world is getting so scary. Do you currently have any plans to tour out of Europe? We would love to! But for the moment only European tours are possible for us. We have just finished a mini tour over Spain, Belgium and the Netherlands and in February we will co-headline another European tour with Amberian Dawn. There are still a few dates to announce. We really hope we can make it outside Europe one day! Cross fingers! Your songs are mostly on Spanish and English, are you going to stick to the same trend or this can be changed in the future? The whole of the songs is in English, even if we use Spanish, Latin and Basque in some titles and sentences inside the lyrics. We have only written a couple of complete songs in Spanish and Basque. After all, we are an “international” band so we prefer to write in English, we are more used to write and listen to metal in English. Anyway, we love languages, so we don’t dismiss anything for the future! Diabulus In Musica sounds like the album name of Slayer’s 1998 release, does it have anything related to Slayer? No, nothing to do. Actually I didn’t know about that when I founded the band. “Diabulus (or Diabolus) in Musica” is a Latin mediaeval word which means ‘the devil in music’. It was like that as they called the triton or the interval of the augmented fourth. The medieval ear was used to hearing perfect fourths and perfect fifths, (early music instruments are tuned different, in meantone tuning). The augmented fourth, being half-way between these two most common intervals, was about the worst discord imaginable. That’s why they thought that the devil was inside the triton. The reason I chose this name was because of my music studies and my passion for Early Music. I studied classical singing but I’ve been above all focused in Historical singing. The name was perfect for us not only because of the meaning it has to me, but also because it sounds a bit dark, as our music sometimes. We like this ‘dark romantic aesthetic’ as well as Early Music (actually we have included these elements in our music more than once), so we thought Diabulus in Musica was the name that fit us the best. What are your plans and future for Diabulus In Musica, how do you look through the future in the next few years? We will continue making music, for sure! We usually don’t think a lot about the future, we prefer to work day by day, little by little and enjoy every present moment. Of course our dream will be to keep on growing, tour as much as we can and why not, living on the band! But as I said, for the moment we will just focus on doing our best, keep on learning and keep on improving. It was really a pleasure to have this Interview with you, Thanks for your time for us, Do you have any message for the fans? Our pleasure! Thank you so much for your questions! Thanks also to the readers and fans for your support. We really hope to meet you all on the road! Love, Zuberoa.